Is there any solution to rapidly create a high quality website? Yes, there is! I’m talking about CMS (Content Management Systems). A CMS provides an easier way to create, maintain, and publish a website. No, you do not need to have a great knowledge about HTML, CSS, or any programing language to work with a CMS. This is the great trick: with CMS such as Joomla you can create/edit web pages as easy as edit a Word document. Drupal is also a very good CMS. It has more advanced user interface than Joomla. Between those technologies, I choose Joomla. Currently Joomla is one of the most used CMS (Content Management System) in the market. It has a huge amount of user and tutorials online. Further it has already a lot of implemented plug-ins ready for use. It provides a safe and fast way to create, maintain, and publish information online. If you thought that could not be better, Joomla has one of the most intuitive and nice interface among the existing CMSs. Even who does not have deep knowledge in web programming can use it. Once you installed Joomla in your webserver, you are ready to start create new pages for your website. First you need to access your Joomla website administrator’s area. There you will see a control panel, where you will be able to manage your entire website. 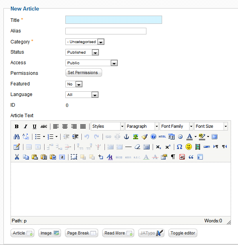 Articles are the main content type managed by Joomla. They are basically text elements and you can add them going to the articles manager. Joomla architecture requires that every article belong to a category, so before you start creating an article, make sure that its category is already created. Is it too complicate? So let’s think a category as a container that will keep your articles. With the Joomla 2.5 you can nest categories. In other words you can nicely organize your article within one category that is within another category. To create a new category go to “Content>Category Manager>Add New Category” menu or click on the Category Manager Button from the control panel. In the Category Manager, click the “New”. To create a new article go to “Content>Article Manager>Add New Article” menu or click on the “Add New Article” Button from the control panel. You will be taken to a page (Figure 2.2) where you will create your text. It seems as a sort of Microsoft Word. Basically what you see is what get, you can format your text as well as you do in the Microsoft interface. Whatever you do on this page will be translated by the software into HTML which can be read by web browsers as a webpage. You must add the article’s title and select its category. Further text you can also add images in your article’s content. You can also add a SEO (Search Engine Optimization) information click on the Meta Tags option on the right hand side. When you are happy with your article, click on the “Save” button and your article will be ready to go. You might add some others parameters to your article such as Title Alias, Author Alias, etc. However those setting can be left blank if you desire. The one basic parameter you will want to change is the Start Publishing date. By default, that date is set to publish the new article the day after posting. You should change your article’s settings to the current that, If you want that your article be displayed now. The article will then appear on the front page. For more information, look at http://www.joomla.org/. There you will find a lot information and be able to download Joomla. In the next articles I am going to explain some more features and how to work with Joomla. So keep it up!